“We do not need new clothes, we need a new look.” So, says the landing page on the Roupa Livra website. Roupa Livra is all about sustainable fashion and eco-fashion. The sustainable and eco fashion industry has been growing from strength to strength as the alternative to mainstream fashion. It aims to reduce the carbon footprint and limit the environmental impact created by producing fashion products. It is consciously driving and promoting social responsibility. Sustainable fashion brands are inclusive but not limited to recycled clothing, high-end clothing rentals, and do-it-yourself clothing. The 2016 Copenhagen Fashion Summit had over 1,200 participants. It’s one of the world’s largest sustainable fashion events. Similar events can be found in major cities like London, Toronto, New York and Berlin. Brazil is also part of this global phenomenon. One of the leaders in this movement in Brazil is Mariana Pellicciari. Marianna is the founder of the Roupa Livre, a movement which engages people and promotes a new way of looking at clothes. Since creating Roupa Livre two years ago, more than 4,000 people have joined the revolution to rethink how they see clothes. The Roupa Livre community hosts a series of ‘do it yourself’ workshops, lectures, and events. Mariana has also written a digital book which offers tips on how to care for clothes. She has worked on several related projects and recently crowdfunded the development of the Roupa Livre App, which is a clothing exchange mobile app that works like Tinder. Mariana graduated with a degree in advertising and worked in this industry for 10 years, departing in 2014. Since then she has founded Roupe Livre with the help of a few friends and dedicates her expertise to supporting small and creative businesses.’ Mariana offers her services to projects which are aligned with her life purpose. Let’s learn from Mariana how to build a sustainable fashion movement. 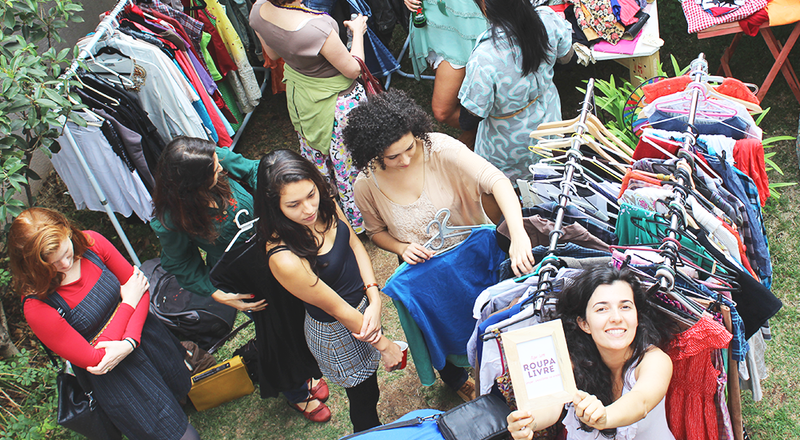 “The Future of Clothes” is the title of the course delivered by the Roupa Livre movement. Its aim is to raise the awareness, educate, and provide alternatives to our relationship with clothes. Research shows that creating a course is a sure way to raise the profile of your movement and bring well-needed attention to your business. It also sets one apart as a leader in their field as a go-to person for resources and information. Mariana delivers this course herself and acts as a facilitator bringing together participants to leverage their ideas and make a plan of action. A movement requires education. What better way to raise attention to your cause and to an important issue? Engagement through learning is an ideal way to position yourself and your organization as a leader in the field. Delivering courses amplifies you, your cause and your business. A good marketing plan includes an e-book. Just like delivering courses, ebooks help you educate your consumers and share information. Writing is powerful for disseminating information. Blogging is usually the default writing tool for most startups, however, an e-book has the potential to reach a wider audience. E-books help you add your own unique voice to the conversation. Additionally, producing an e-book is inexpensive and therefore will not put a dent in your marketing budget. Roupa Livre’s first e-book is a Free Clothing Guide, filled with tips to help you revolutionize your clothing mindset. It offers tips on how to extend the life of your clothing and how to recycle them when they no longer serve their original purpose. Like most e-books, it is free and downloadable directly via the website. Mobile apps are now the new necessity for every business. Research reveals that many businesses’ are now including Apps in their business plans. Apps help build your business by elevating your brand presence. It is also another way to showcase your expertise in a specific area. Engagement with clients can easily be achieved using mobile apps, which work to improve customer loyalty. Sales are also increased with an App, as customers have everything they need at their fingertips. They also improve customer loyalty. Sales are also increased with an App, as customers have everything they need at their fingertips. The Roupa Livra App is used to facilitate matchmaking, similar to Tinder, but for clothes. It is currently being crowdfunded and its aim is to further enhance the wider mission. Mentoring service programs aren’t just limited to academic organizations. Startups are uniquely positioned to offer mentoring services as well. At Roupa Livre, Mariana offers a specialized mentoring service in the form of consultations. Mariana helps her mentees develop clear objectives and work through their multiple ideas. She also offers project planning and business model development to help mentees get their projects off the ground. Mentoring programs act as a tool to empower individuals to become successful in their chosen fields. They also distinguish your brand from others who may not be doing the same. Events are a superb form of marketing. Holding regular events brings people together allowing for Clothing Workshops, Coffee with Sewing, Pimp My Clothes, co-working spaces to work real time alongside your peers repurposing clothing and lastly, a series of talks. These talks include a panel of guests discussing topics related to conscious consumption and developing new relationships with clothes. Events bring different types of people together, facilitates learning and creates a hub of activity in a specific industry. The fashion industry is the second most polluting industry in the world. Exploitative labour is also a well-known problem in today’s global fashion market, Many big name brands are involved in such practices. Seeking out more sustainable ways to improve the fashion industry is one of the main aims of Roupa Livre. Instead of creating new things, Roupa Livra aims to repurpose existing clothing. Finally, through education and the use of unorthodox business models, Mariana is working towards building a new narrative around clothes and how they are viewed amongst Braziliians. Like this article? Join our Fabulous Fempreneurship Facebook mastermind for a great place to meet and learn about business topics for women entrepreneurs. New to business? Check out our Fabulous Fempreneurship Business Startup Guide. The founder of Fabulous Fempreneurship is Elaine Slatter, Owner of XL Consulting Group, a small business advisory for startups.